Curriculum, Elections, Governance/Board Decision Making, What Can I Do? JStanding in front of a giant projection screen with his wireless remote control and clip-on microphone, Madison School Superintendent Art Rainwater on Monday unveiled his grand vision for Madison’s four major high schools. But the real backdrop for his presentation before the Madison school board was the criticism of changes implemented last year at West High and proposed this year at East. Both involved reducing course offerings in favor of a core curriculum for all students, from gifted to struggling. Rainwater stressed his intention to start from scratch in overhauling all aspects of the education provided at West, East, Memorial and La Follette, whose combined enrollment tops 7,600 students. The move follows consolidation of practices in the city’s elementary and middle schools. But it may prove more challenging, since the high schools have a longstanding tradition of independence. Heterogeneous classes, which until last week were the district’s preferred direction for high school changes, are, said Rainwater, “only one piece” of the redesign. But curriculum changes are clearly going to happen. “It’s not acceptable anymore to lecture four days a week and give a test on Friday,” Rainwater declared. Teachers must learn how to teach students, rather than teach content. The 50 parents and teachers in the audience reacted coolly, judging from the comments muttered among themselves during the presentation and the nearly two-hour discussion that followed. Rainwater, apparently recognizing the damage to parent and teacher relations, sent a memo to principals last week. The four high schools will remain under their current programs until the steering committee gets to work. Chaired by Pam Nash, deputy superintendent of secondary schools, it will include several district administrators as well as experts from the UW-Madison, Edgewood College and MATC. Rainwater sought to assure board and audience members that teachers and parents will have ample opportunity for input. His plan calls for three separate periods of public comment, after which subcommittees will make revisions. The school board will then vote on the recommendations after additional hearings and debate. “You get better input if people have something to react to,” Rainwater said, adding that involving teachers in all stages would be impractical, because it would be difficult to cover their teaching assignments. That comment drew a collective groan from teachers in the audience. Rainwater’s call for a revamping of the city’s high schools suggests the current approach isn’t working. And that poses a dilemma for school officials. The district likes to tout its record number of National Merit semifinalists and state-leading ACT scores as proof that its high schools are successful. Many parents worry that those high-end benchmarks are under attack. But Madison’s schools continue to fail countless kids — mostly low-income and minority students. This is a profound challenge hardly unique to Madison, but one that deserves more attention from policymakers. Research in education, the starting point for Rainwater’s steering committee, offers promising solutions. But the district risks much in excluding teachers from the start, since inevitably they will be on the front lines of any change. And excluding parents could heighten the alienation that has already prompted some middle- and upper-class families to abandon the public schools. While struggling over details, most board members conceptually support the study. During their discussion Monday, Lawrie Kobza cut to the chase. “What is the problem we’re trying to solve?” she asked. “And is this how we solve this problem?” Kobza professed not to know the answer. But these are the right questions to ask. Community Partners, Curriculum, Governance/Board Decision Making, School Climate, What Can I Do? By 2014, just eight years from now, the No Child Left Behind Act mandates that there be no racial achievement gap in American education — none. All children — black, white, Hispanic, Asian — will be performing on the same bell curve of test scores. It’s a tough deadline and a beautiful idea. Trouble is, despite Bush administration claims, most studies show it is not happening. Test score gaps show up in kindergarten, and just get worse, except where they don’t. There are trend-bucking success stories in this country – remarkable schools where that gap is being closed, child by child. This hour On Point: we talk with three principals in the trenches who have made it happen in the war on America’s education achievement gap. Milwaukee police officers will be assigned for the first time to full-time duty inside city public schools under an agreement between police and Milwaukee Public Schools leaders. The effort to improve school safety will begin small – with two pairs of officers in the spring semester, which begins in late January – but all involved hope that it will grow by next fall, provided that money can be found to do that. In releasing details of the police plan late Tuesday, MPS Superintendent William Andrekopoulos also said he expects to propose in December that MPS spend about $450,000 during the rest of this school year for increased services from a Milwaukee County mental crisis intervention team that deals with children. Andrekopoulos said “more anger and hostility” were showing up among MPS students and that mental problems have been a factor in some recent violence. Some difficult people are merely minor irritants: Others learn to avoid them as much as possible, and the overall working environment is not badly compromised. But a person who targets others, makes threats (direct or indirect), insists on his or her own way all the time, or has such a hair-trigger temper that colleagues walk on eggshells to avoid setting it off, can paralyze a department. In the worst cases, this conduct can create massive dysfunction as the department finds itself unable to hold meetings, make hiring decisions, recruit new members, or retain valued ones. When I first got involved in helping department heads cope with such people, my colleagues and I used concepts and approaches we gleaned from studies of bullies. The bullies I have encountered in the academic environment come in many forms, from those who present themselves as victims, all the way to classic aggressors who rely on physical intimidation. In academe and other settings populated by “knowledge workers,” one often encounters other kinds of bullies as well, including “memo bullies” (who send regular missives to a long mailing list) and “insult bullies” (destructive verbal aggressors). 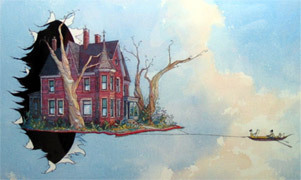 Jason Shephard discussed local bullying in last spring’s “The Fate of the Schools“. Jason Brown doesn’t know what to do if his 14-year-old son doesn’t get into a good high school next year, namely Rufus King or Riverside. ellow Milwaukee Public Schools parent James West feels equally uneasy about finding that a teacher had given a near-perfect score to what he called a near-incoherent essay by his daughter. Anthony Drane, who works in a supplemental instruction program at Milwaukee Area Technical College, fears for his children’s futures when he encounters former MPS students who lack basic study skills such as note taking. The problem, the three fathers have concluded, is not just that Milwaukee’s public schools are in crisis but that there aren’t enough parents like them who are alarmed and trying to do something about it. They hope to change that with the North Milwaukee Parent Association, a citywide group that intends to motivate parents by giving them the knowledge and support to participate in the school system. The idea, they said, is that empowering Milwaukee’s youths must start with educating their guardians. College Preparation, Community Partners, Curriculum, Elections, Governance/Board Decision Making, School Climate, Staff Support, Student Support, What Can I Do? Here is a copy of Monday night’s presentation. I amended it to include the listening sessions with the individual schools as the first step in the process. [354K PDF Version] Video here. Curriculum, Governance/Board Decision Making, School Climate, Staff Support, Student Support, What Can I Do? Four citizens spoke at Monday evening’s school board meeting regarding the proposed “high school redesign”. Watch or download this video clip. Superintendent Art Rainwater’s powerpoint presentation and followup board discussion. Watch or download the video. East High School Principal Allen Harris’s letter to parents. On, off and on again School Board High School Redesign discussion. Marc Eisen: Superintendent Halts High School Redesign. Laurie Frost: More Than English 10: Let’s REALLY Talk About Our High Schools. Ruth Robarts: On Monday, November 27, the Madison School Board will begin to address rumors about major changes coming to our high schools. There are some realities behind the rumors. Andy Hall: East High Student Insurrection over Proposed Curriculum Changes? A timeline of West High School’s March Toward One Size Fits all English 10. Bruce King’s report on West High School’s English 9 Program. Carrie Lynch: One big happy classroom? Madison United for Educational Excellence hosted a conversation with Art Rainwater Wednesday evening . Three times in the past week, I’ve witnessed parents of young children ponder whether to trust education of their offspring to Seattle Public Schools. In raising children, however, families cannot afford mistakes. When a young life gets off on the wrong track, its retrofit can get more complicated than putting new rails in a tunnel. And a city increasingly populated by singles and childless couples badly needs families with children. A disastrous mandatory busing program drove working families from Seattle during the 1970s and ’80s. Loss of confidence now threatens public schools with an institutional death spiral. What happens? People use their doubts and subpar average test scores — which shouldn’t mean much to the middle class, given scores’ correlation with poverty — to justify leaving, without really exploring, what is offered by their local school. The Madison School Board has recently opened a new chapter in it’s governance responsibilities by discussing substantive issues (things that would have never made their agenda two years ago, like rigor, budget details (recently revealed structural deficit) and health care costs, among others). Don’t roll back the clock, run for school board! Two pillars of the classical musical establishment, Carnegie Hall and the Juilliard School, have joined forces to give birth to a music academy whose fellows will go forth and propagate musicianship in New York public schools. The city’s Education Department is opening its arms to the new program, seeing an inexpensive but valuable source of teaching for a system deprived of comprehensive music training. And the leaders of Carnegie and Juilliard see an opportunity to promote their conviction that a musician in 21st-century America should be more than just a person who plays the notes. Under the new program elite musicians will receive high-level musical training, performance opportunities at Carnegie Hall and guidance from city school teachers in how to teach music. The fellows will each be assigned to a different school and work there one and a half days a week. They will teach their instruments, or music in general, and give their own pointers to school music teachers. e. Comprehension: making sense of text. Every “school” of reading instruction agrees on these five, whether the schools are Direct Instruction or constructivist (whole language and balance literacy). However, direct instruction makes certain that every child masters every skill. Direct instruction leaves nothing to chance. On the other hand, constructivist theory lets the child “discover” these five skills. Consequently, some children will discover them all; some will discover some of them; some may not discover any of them. In short, learning is too important to be left to chance. Kudos to the district for stopping the rush to the middle Rainwater and his assistants have been promoting for East. However, the changes that were pushed onto West should also be backed off while the district has a long overdue, community-wide conversation about what it desires its high schools to provide all students. And this time, let’s have that discussion backed with empirical studies. Even if the community agrees with Rainwater (and some if not all of the BOE) that closing the minority achievement gap takes priority over other educational goals, let’s have a frank discussion as to how that is best achieved. Madison school Superintendent Art Rainwater has put the brakes on recently proposed changes to the city’s high schools as part of an effort to make long-term progress. Erpenbach argued that closing tax exemption “loopholes” would save every homeowner thousands of dollars a year in property taxes and take a giant step toward eliminating funding disparities between rich and poor school districts. But Secondary Education Director James VanSciver and other Seaford educators became convinced that with extra help, many more students could be taking algebra in middle school and college-level courses in high school. Four years ago, they began offering special tutoring, summer classes and Saturday classes. The number of Advanced Placement classes at Seaford High swelled from four to 14. The focus on helping average students also boosted minority enrollment in the most rigorous classes. The district has about 3,400 students, 40 percent black and slightly more than half white. Through the initiative, administrators found more black students doing well and going on to college. A discussion regarding the future of Madison’s high schools is back on the agenda for tonight’s School Board meeting. The controversial item, which involves curriculum changes and other proposals, is scheduled as part of a special board meeting at 8 p.m. in the Doyle Administration Building, 545 W. Dayton St. In an officers meeting last week, School Board President Johnny Winston Jr. removed the topic of high school redesign from tonight’s agenda, saying that he felt the process was not far enough along to produce a productive discussion. But when other School Board members said that they would prefer keeping the subject on the agenda for tonight’s meeting, Winston agreed to return it to the lineup of topics. The special session will follow meetings of the communications committee at 5 p.m., the human resources committee at 6 p.m. and the finance and operations committee at 7 p.m.
Later tonight, the board also is expected to go into a closed-door discussion of the negotiation strategy regarding Madison Teachers Inc., the teachers union. What a difference a couple of elections make! In November of 2005, the MMSD Board of Education held two meetings (and the attendance task forces met six times). This November, the Board has six meetings of the full board, including executive and open sessions, and ten committee meetings. The Equity Task Force will meet once. Congratulations to a harder working, more effective board. Let’s elect people in the spring who will conintue this new board’s committment to overseeing management of the MMSD. Events, School Climate, What Can I Do? Five University of Wisconsin-Madison faculty members are among the 449 scientists and engineers to be awarded fellowships from the American Association for the Advancement of Science (AAAS), which were announced this week (Nov. 23). The AAAS grants the distinction to researchers advancing science and engineering in significant ways. New fellows will be recognized at the Fellows Forum, held during the 2007 AAAS annual meeting in San Francisco on Feb. 17. Janet E. Mertz, professor of oncology, for the development of recombinant DNA methods and for the co-discovery of introns, messenger RNA transport elements and mechanisms by which viruses regulate their expression. The AAAS is the largest scientific society in the world. Founded in 1848, the AAAS publishes the journal Science. Janet’s SIS posts can be found here. At hundreds of screenings this year of “An Inconvenient Truth,” the first thing many viewers said after the lights came up was that every student in every school in the United States needed to see this movie. The producers of former vice president Al Gore’s film about global warming, myself included, certainly agreed. So the company that made the documentary decided to offer 50,000 free DVDs to the National Science Teachers Association (NSTA) for educators to use in their classrooms. It seemed like a no-brainer. Gore, however, is not running for office, and the film’s theatrical run is long since over. As for classroom benefits, the movie has been enthusiastically endorsed by leading climate scientists worldwide, and is required viewing for all students in Norway and Sweden. In the good old days, students simply used technology like cellphones to cheat on tests. Now, they’re posting what happens in their classrooms on YouTube. YouTube removed the video at the request of the Portages-de-l’Outaouais school board a week ago, the board president Jocelyn Blondin said. But that has left the question of determining what to do with the students and how to prevent similar episodes in the future. A lengthy discussion of what it might take to close the minority achievement gap in the New York Times Magazine entitled, ” What It Takes to Make a Student”. The study Larry Winkler has so cogently referenced time and again here is highlighted. The author concludes that low-income minority students need better educational opportunities than their middle class white counterparts. If there is a limited budget for education, does this mean then that those middle class students must accept less? Is it this thinking that is driving the elimination of diversity in our high school curricula? As I read this article, the greatest chance of overcoming disparities resides in early childhood and elementary experiences, not in dismantling the high school curriculum. The schools that are achieving the most impressive results with poor and minority students tend to follow three practices. First, they require many more hours of class time than a typical public school. The school day starts early, at 8 a.m. or before, and often continues until after 4 p.m. These schools offer additional tutoring after school as well as classes on Saturday mornings, and summer vacation usually lasts only about a month. The schools try to leaven those long hours with music classes, foreign languages, trips and sports, but they spend a whole lot of time going over the basics: reading and math. At KIPP’s Bronx academy, the sixth, seventh and eighth grades had proficiency rates at least 12 percentage points above the state average on this year’s statewide tests. And when the scores are compared with the scores of the specific high-poverty cities or neighborhoods where the schools are located — in Newark, New Haven or the Bronx — it isn’t even close: 86 percent of eighth-grade students at KIPP Academy scored at grade level in math this year, compared with 16 percent of students in the South Bronx. Toll put it this way: “We want to change the conversation from ‘You can’t educate these kids’ to ‘You can only educate these kids if. …’ ” And to a great extent, she and the other principals have done so. The message inherent in the success of their schools is that if poor students are going to catch up, they will require not the same education that middle-class children receive but one that is considerably better; they need more time in class than middle-class students, better-trained teachers and a curriculum that prepares them psychologically and emotionally, as well as intellectually, for the challenges ahead of them. The most malignant element of the original law was that it required all states to achieve proficiency but then allowed each state to define proficiency for itself. It took state governments a couple of years to realize just what that meant, but now they have caught on — and many of them are engaged in an ignoble competition to see which state can demand the least of its students. The evidence is now overwhelming that if you take an average low-income child and put him into an average American public school, he will almost certainly come out poorly educated. What the small but growing number of successful schools demonstrate is that the public-school system accomplishes that result because we have built it that way. We could also decide to create a different system, one that educates most (if not all) poor minority students to high levels of achievement. But there are still those few schools, mostly charters, that really do seem to have found the right formula: high standards, a structured instructional approach, character education, long hours, great teachers and development of a esprit d’corps. In emphasizing race-based achievement gaps, “Schools Slow in Closing Gaps Between Races” (front page, Nov. 20) pays insufficient attention to the significant role of socioeconomic inequalities in explaining these gaps. As long as proponents of No Child Left Behind continue to dismiss the examination of the economic backgrounds of students as an example of what President Bush has called the “soft bigotry of low expectations” or as an excuse for low achievement by low-income students, standards-based reforms like No Child Left Behind will have limited effects. It is time for policy makers to place as much emphasis on reducing poverty as they do on improving the schools attended by poor children. Both are necessary, but are alone insufficient to reduce the achievement gap. The writer is a professor of education, sociology and public affairs at Rutgers University in Newark. Yes, the achievement gaps remain persistent. But perplexing? Come on. Having 10 years’ experience teaching in low-income, largely black districts, and also having raised three middle-class white children, I consider it a no-brainer why my children achieve well in school while many of my students do not: I am one mother to three kids, but a teacher to 25. Aside from the socioeconomic differences between my kids and my students (a separate, undoubtedly more important perspective on achievement disparities), my children get more of my attention, period. I want to give all of my students the same advantages I’ve given my own kids, but how can I possibly meet 25 individual needs with as much sensitivity and precision? Why does this discussion always ignore class size as a contributing factor? Why not lower the teacher-student ratio to 1 to 10 for a few years and then study the outcomes? The obvious answer is cost. But perhaps over the years this would be offset by the savings built from a better-educated and more productive group of graduates. No Child Left Behind, signed into law by President Bush in January 2002, has not closed the achievement gap between minority and white students, but it has had a major effect on education in America. The law has had a major impact on the privatization of education. With financing now available from school vouchers, increasing numbers of both minority and white families are placing their children in private and religious schools. In addition, American schools are increasingly becoming racially segregated as white parents remove their children from public education. How can you discuss the test-score gaps between minority and white students without attributing some of the problem to the child poverty rate of almost 18 percent, the child hunger rate of 17 percent and the 19 percent uninsured rate for poor children, when African-Americans and Hispanics bear the brunt of those disadvantages? Yet the education experts quoted in your article speak as if poverty and hunger, and the illnesses associated with them, had no effect on children’s school attendance and capacity to learn. No Child Left Behind is big on testing and promises. But it does far too little to address the social and economic needs of black, Hispanic and poor white children — needs that are inextricably linked to school achievement. The writer is the emeritus dean of the Graduate School of Education, Rutgers University. Standardized tests may be relatively efficient to administer, but they do not provide the information educators need to understand and work to close the achievement gap. Teachers need detailed information about their students’ strengths and areas of need. All they get from a standardized test is a number. If we want to make greater progress toward the goal of leaving no child behind, let’s shelve those standardized tests and work together to truly understand the nature of the achievement gap and the academic, social and economic factors that contribute to it. The writer is an associate professor of literacy education at Mercy College. A new approach to closing the education gaps between races is needed. Instead of looking at the performance of unsuccessful schools, unsuccessful teachers and poorly performing minority students, why not look for the factors that underlie success? I come from Tehran and no, there are no camels where I come from. There are cars and honking taxis that pass women in black veils or short, colorful scarves that barely cover their heads. In this beautiful prison of banned dreams, there certainly isn’t a statue of liberty; men and women liberate themselves with cafes, cigars, smuggled drugs and secret relationships. In America, I am a writer. I can imagine, dream, live, breathe as an Iranian, an American. I can add color to anything; if only I could paint the gray streets of Tehran with my words. When I decided to become a principal I promised myself that I would do several things. One was to work as hard as I could to make quality education a reality for all of the students in my building and the second was to pay attention when confronted by people’s concerns and hopes. As I have worked at East over the last year and a half I have pushed to get the building under control, to begin a conversation with the teaching staff about high quality instruction, to empower students, and to take an honest look at our data. Sens. Herb Kohl and Russ Feingold, along with Rep. Tammy Baldwin have requested that the U.S. Department of Education investigate Madison Schools’ loss of an estimated $3.2 million after the district refused to dismantle its successful reading program two years ago, and seek to have the grant re-instated. In a letter to Terrell Halaska , USDOE assistant secretary for legislative and Congressional affairs, the Wisconsin Congressional members said, “The report from the Office of Inspector General questions the program’s credibility and implies the Department broke the law by interfering in the curriculum decisions made by schools, thereby failing to follow proper grant review procedures. The Elementary and Secondary Education Act (now referred to as No Child Left Behind) is before Congress for reauthorization in 2007. Discussion of Reading First is sure to be part of Congress’ examination of needed modifications to the law. The high school dumbing down (aka high school redesign) shows the MMSD administration’s loss of will, as well as its refusal to adopt curriculum changes needed to close the achievement gap. The gap begins in elementary school: 46% of black students score below grade level on the third grade reading test, but only 9% of the white students. The gap remains into high school: 49% of black 10th graders score below grade level in reading, while only 12% of the white students are at the minimal or basic levels. Facing the failure to raise the performance of black students, the MMSD superintendent and his administrators have thrown up their hands and turned to dumbing down the curriculum. The gap remains because the superintendent and administrators refuse to use curricula that will raise performance. For example, the MMSD clings to expensive and ineffective Reading Recovery and fuzzy math in the lower grades, while refusing to expand Read 180 which the district’s reading staff trumpeted for its success in upper grades.Previous boards and some current members share the responsibility too, because of their insistence that they have no role in curriculum issues. Fortunately, the insistence of some board members to hold a public session on high school dumbing down might represent a modicum of hope that curriculum improvements may be possible. About 70% to 85% of Wisconsin students were considered proficient or better on the state’s reading and math tests for the 2005-’06 school year. Yet only 33% to 40% of the state’s fourth- and eighth-graders scored at least proficient on the most recent National Assessment of Educational Progress in those subjects, according to the study by the Wisconsin Taxpayers Alliance. The state was one of 16 in the country that had a proficiency gap of 45 to 55 percentage points, the Taxpayers Alliance found. Several states, such as Oklahoma and Mississippi, had even larger differences between the percentage of students considered proficient by their states as opposed to the federal government. The blame doesn’t necessarily fall on the Wisconsin Knowledge and Concepts Examinations, said Tony Evers, deputy superintendent of the state Department of Public Instruction, which administers the tests annually. More on the Fordham Foundation’s report and EdTrust. Finally, WISTAX offers a free report on testing. November 7 was a great day for our children and for the community. Certainly, the fact that we will have a new school in an area that is experiencing substantial growth is important for our future. The relief that the community approved from the revenue cap will mean that we will have to reduce our services by less than expected, although we will still have to make cuts of several million dollars. Every staff member whose position is saved to serve children is important and $807,000 of relief will save a number of services. The most obvious gains aside, it was just as important that the passage of the referendum involved support from the whole community. The grassroots organization CAST (Community and Schools Together) worked long and hard to be sure that our citizens understood what was at stake and how important their vote was. District staff from the central office, building services and the schools supported this through their hard work and discussion with neighbors and friends. Thanksgiving is a time to savor good food, something you don’t expect to find in a school cafeteria. In fact, most schools across the country serve reheated, premade food that is trucked in from central kitchens. Daily offerings are often uninspiring: chicken sticks, macaroni and cheese, and pizza. But there is a move in some parts of the country to bring real cooking back to school kitchens. Last year, Abernathy Elementary School in Portland, Ore., bought a second-hand stove and a big mixer and started cooking all its food from scratch. Budget/Financing, Governance/Board Decision Making, School Climate, Staff Support, What Can I Do? ARE TAXPAYERS BEING TAKEN FOR A RIDE? I am still amazed four years later after a transportation department change that was made during a budget crunch timeframe, that not only is the department still lacking the secretarial position, but it increased the salary and benefits level of every player involved in the situation. Are the students, parents and school staff being better served by the Transportation Department’s surplus of a knowledgeable union employee (4 years ago today)? Has the fact that the Transportation Coordinator was promoted to Manager, and the newly hired Transportation Coordinator (a former staff of First Student Bus Co) helped with the enormous amount of phone calls that department receives on a daily basis? I find it hard to believe knowing that the district is maintaining an employee on staff (not even a union employee) waiting for the position of the transportation secretary, to once again be posted and for her to be hired. Until then, I hear the secretaries in the schools and other district operations saying they can’t get anyone to talk to in the Transportation Dept or that the carriers have been given the go-ahead to make the decisions. 1. Initiate and complete a comprehensive, independent and neutral review and assessment of the District’s K-12 math curriculum. •	The review and assessment shall be undertaken by a task force whose members are appointed by the Superintendent and approved by the BOE. Members of the task force shall have math and math education expertise and represent a variety of perspectives regarding math education. •	The task force shall prepare and present to the BOE a preliminary outline of the review and assessment to be undertaken by the task force. The outline shall, at a minimum, include: (1) analysis of math achievement data for MMSD K-12 students, including analysis of all math sub-tests scores disaggregated by student characteristics and schools; (2) analysis of performance expectations for MMSD K-12 students; (3) an overview of math curricula, including MMSD’s math curriculum; (4) a discussion of how to improve MMSD student achievement; and (5) recommendations on measures to evaluate the effectiveness of MMSD’s math curriculum. The task force is to present the preliminary outline and a timeline to the BOE for comment and approval. •	The task force is to prepare a written draft of the review and assessment, consistent with the approved preliminary outline. The draft is to be presented to the BOE for review and comment. •	The task force is to prepare the final report on the review and assessment. 2. Develop in collaboration with the Board and external advisors, a plan for the District to communicate to the community why parents or guardians should send their children to MMSD schools. Specific tasks include (1) determining what parents and guardians consider important in selecting schools; (2) determining whether and how MMSD schools provide what parents and guardians consider important in selecting schools; (3) using the information gained from parents and guardians, developing a vision of what MMSD should be in the future; and (4) developing a communications plan to promote MMSD schools and why parents or guardians should send their children to them. Timeframe to develop: 6 months. 3. Provide information to the Board in a clear, accurate, complete yet concise, and timely manner. The Board will evaluate progress on this goal through the use of a rating sheet for Board members to give periodic feed-back on the information they receive from the administration. Information provided to the Board shall be rated for timeliness, accuracy, organization and presentation. 4. Implement the Administrative Intern Professional Development Program. Program participants should be selected by the 4th quarter of this year. Special attention will be given to the recruitment of people of color and other historically under-represented groups in administrative positions in all employment categories of the District. (principals, building services, etc.) A report on the program shall be provided to the BOE at least annually. The Superintendent’s Review (something that was not done for a number of years until a few incumbents lost their seats). Taking a substantive look at healthcare costs. Diving deep into the District’s $332M+ budget. A presentation on the redesign of Madison’s high school curriculum scheduled for next week’s School Board meeting has been scrapped for the immediate future, School Board President Johnny Winston Jr. confirmed late this morning. “We’ll hold off on changes until we get a better feel for how the process will work,” Winston said. Winston, other School Board members and members of the administration met this morning to discuss high school curriculum proposals, including changes in accelerated classes for freshmen and sophomores at East High. Madison School Board President Johnny Winston Jr. said community outcry and confusion over East’s plans to restructure its classes likely will dominate the board’s discussion of reforming operations in the district’s high schools. The meeting is set for 8 p.m. Monday in the auditorium at the Doyle Administration Building, 545 W. Dayton St.
Winston said he expects people riled about potential or recent changes at La Follette and West high schools also will attend. The board, Winston said, needs to set direction for the district’s schools and needs to be kept informed. He’s opposed to eliminating classes for talented and gifted students. “We need to be enhancing them,” he said. It’s essential, Winston said, for parents, students, teachers and the community to have a voice in any talks about changing the way schools are run. “I really hope we can get this thing, whatever it is, in order,” Winston said. Indeed, a look at the School Board’s calendar for Monday, 11.27.2006 reveals that the High School Redesign discussion is scheduled for 8:00p.m. that evening. The Board has been criticized over the years for simply not discussing some of the tough issues such as health care, the District’s rejection of $2M in federal Reading First funds (the politics and implementation of Reading First have been controversial. However $2m is $2m and it at least deserved a public conversation) and West High’s full speed ahead on a one size fits all curriculum (See also “the Fate of the Schools“. I’m glad to see the Board take this up Monday. A recent discussion of the District’s quiet policy change regarding credit for non-madison school district courses appeared, disappeared and now is on a 12/11/2006 Performance and Achievement committee agenda. Curriculum - Fine Arts, What Can I Do? There have been programs promoting theater involvement in New York City schools for years, but Fidelity Investments, together with the Viertel/Frankel/Baruch/Routh Group, the Broadway producing team behind “Hairspray” and “Company,” and Leap, a 30-year-old non-profit organization dedicated to arts education, have announced one of the broadest programs yet. Other organizations, like Theater Development Fund, have programs to involve students in Broadway theater, but this one, which started last month at 10 high schools and junior high schools in the city, aspires to be the most comprehensive. It is a seven-month course involving big-name theater professionals, trips to Broadway shows, playwriting and play producing classes and, for 10 students, a Broadway stage on which their plays will be performed. “We have never done a program as comprehensive as this,” said Alice Krieger, the associate executive director of Leap. The uproar over proposed changes in East High School’s curriculum has apparently prompted Madison School Superintendent Art Rainwater to announce a halt to any plans to change programming at Madison’s four major high schools. First, I want to say BRAVO, RUTH, for putting it all together and bringing it on home to us. Thanks, too, to the BOE members who overrode BOE President Johnny Winston Jr’s decision to table this important discussion. Finally, deepest thanks to all of the East parents, students and teachers who are speaking out … and to the many West parents, students and teachers who have also spoken out over the past few years. As we begin what will hopefully be a thoughtful and thoroughgoing community-wide conversation about what’s going on in our high schools, I’d like to clear up some muddiness about what’s happened at West in the past few years. I think it’s important to have our facts straight and complete. In doing so — and in comparing what’s happened at West to what’s now going on at East — I’d like to draw on the image of an animal experiment (that apparently never happened). In one condition, a frog is put into a bath of cool water, the temperature is gradually raised to boiling, and the frog dies without a struggle. In another condition, a frog is put into a bath of boiling water, immediately jumps out, and lives to tell the tale. As I see it, West was put in the first condition. The administration implemented small changes over the course of several years, with the ultimate goal of turning 9th and 10th grades into two more years of middle school. Students and parents were lulled into thinking that everything was O.K. because, hey, what’s one small change? East, in contrast, has been put in the second condition. There, the administration seems to have the same goal of turning 9th and 10th grade into two more years of middle school, but has introduced all of the changes at once. Like the frog placed in the boiling water, East has been shocked into strong reaction. Viewpoints coming to Madison School board members illustrate the need for a thoughtful look at new goals or curriculums for our high schools. Here are two samples from e-mail to the board on November 22. On Monday, November 27, the Madison School Board will begin to address rumors about major changes coming to our high schools. There are some realities behind the rumors. For example, West High School substantially reduced the English courses for tenth graders this year. The principal at East High School met with parents last week. He delivered a message that many parents understood as an explanation that decisions on curriculum changes at EHS have already been made and would be carried out. Period. He has since said that he welcomes student and parent viewpoints. End of Gifted Class Drawing Protest And last month there was–to say the least–confusion and misinformation about when students can opt to take college courses for high school credit. However, the main source of community comment and concerns may be Superintendent Rainwater’s October editorial announcing his commitment to redesign of the high schools. Changing our high schools The editorial that went sent to homes across the district via student backpacks is long on generalities and short on specifics, giving rise to the kinds of questions that I have been hearing at work. In my opinion, now is the right time for the school board to set parameters and goals for changes in the high schools. That’s our role. We should hear the ideas coming from the schools and their communities as well as those coming from central administration before any process to redesign the schools goes forward. I welcome both an on-going board discussion and community public discussion of possible changes to our high schools, particularly changes that could raise academic goals for all students and ensure a wide range of academic challenging courses and activities. High school students in the United States are consistently outperformed by those from Asian and some European countries on international assessments of mathematics and science, according to The Condition of Education 2006 report released today by the U.S. Department of Education’s National Center for Education Statistics (NCES). Fourth-graders, by comparison, score as well or better than most of their international peers, although their counterparts in other countries are gaining ground. The Condition of Education is a congressionally mandated report that provides an annual statistical portrait of education in the United States. The 50 indicators included in the report cover all aspects of education, from student achievement to school environment and from early childhood through postsecondary education. The report shows that U. S. public schools have the most diverse student population than at any other time in history. In addition, more individuals are enrolling in postsecondary education, and more bachelor’s degrees have been awarded than in the past. The Madison School Board has given Superintendent Art Rainwater a set of specific orders to accomplish in the coming year, including several directives to take an in-depth look at the district’s entire math curriculum. In the past several years, area math educators have expressed concern about the effectiveness of the Madison district’s reliance on a reform math curriculum, which emphasizes word-based problem-solving. Another goal board members mandated for the superintendent for next year is that he collaborate with them and other advisers on a plan to tell community members why parents and guardians should send their children to Madison public schools. In addition, the board will evaluate the administration on providing information in a clear, accurate, concise and timely manner. A report made public today [Wisconsin DOA 2007-2009 Budget Reports] identifies a $1.6 billion gap between what state officials say they need to run their agencies over the next two years and what taxes and other revenues will bring in over that period. Without a veto, Dane County Executive Kathleen Falk signed the $450 million county budget that she said protects public safety, human services and the environment. For the average $240,000 Madison homeowner, the county portion of the property tax will increase by almost $16, which represents a 4.88 percent increase, WISC-TV reported. Locally, the Madison School District’s property tax assessments will go up less than the County, about 3.2%. Curriculum, Governance/Board Decision Making, School Climate, Student Support, What Can I Do? East High Student Insurrection Over Proposed Curriculum Changes? “This is a discussion killer and it’s an education killer because it’s going to make kids feel uncomfortable,” Collin said Monday of the emerging plan, which would take effect in the fall. This morning, Collin and other students – he says it may involve 100 of the school’s 1,834 students – plan to protest the planned changes by walking out of the school at 2222 E. Washington Ave. Some may try to meet with Superintendent Art Rainwater at his Downtown office. East Principal Alan Harris said he’s heard talk of a student protest. Students refusing to attend class would be dealt with for insubordination, he said, and could face suspension, particularly if he determines their conduct is unsafe. Harris said he’s met with parents, staff members and students, and more private and group meetings are planned, to hear their concerns. However, Harris said he believes he remains on the right track. East, he said, must change. Read the extensive discussion on the Madison School District Administration’s High School redesign plans here. The Madison School Board will meet to discuss the proposed high school changes on November 27, 2006. The Madison Board of Education has completed the evaluation of Superintendent Art Rainwater for the 2005-06 school year. The Board met several times since September in executive session to complete the Superintendent Appraisal Report and discuss goals for this year. We also discussed the goals from last year in open session, which the Superintendent has successfully completed. The October 30, 2006 Board of Education met to discuss a series of resolutions, and approve the final 2006-07 MMSD Budget, and approve the AFSCME Local 60 contract. The video of the meeting is 210MB, and 2 hours and 30 minutes long. Click on the image at left to watch the video. The video contains chapter headings which allow quick navigation to sections of the meeting. The video will play immediately, while the file continues to download. There was a public appearance by Barbara Lewis who expressed concern over the apparent change in policy of MMSD in granting high school credit for courses taken at the University of Wisconsin Madison. Both Superintendent Art Rainwater and Director of Alternative Programs Steve Hartley discussed the issues with the Board and clarified that the policy statement which Ms. Lewis had received, and which apparently was being misinterpreted by some high school staff referred only to Independent Study. The Board, noting confusion of parents, school staff and themselves, requested that these issues be placed on the Board agenda as soon as possible. Resolution supporting expenditures for school security be placed outside the revenue caps. Resolution supporting language by the Superintendent and other superintendents that the State adopt the Adequacy Model for school funding. This portion of the meeting begins at approximately 20 minutes into the meeting and continues until the Board votes to approve the tax levy amount at 2 hours into the meeting. Final approval of the full budget is rescheduled for a later meeting. The discussions included issues of fund equity, the fund reserve, the unexpected decrease of State support, liquidation of earnings on Chavez building funds, changes in the budget necessary to offset decrease in State support, and the minimum decisions the Board needed to make to meet budget deadline. Approval of the AFSCME Local 60 contract, in which the District and Union agree to a health care package containing only HMOs, saving the District significant healthcare costs, in exchange for a generous wage increase. Mutiny on the MMSD Intrepid? Celeste Roberts posted the following comment in an earlier thread, and it’s too good to get lost in the comments section. It deserves recognition on its own. Captain Rainwater of the MMSD Intrepid, renowned ’round the world for his feckless bravery and singlemindedness, stands at the helm of his beloved vessel and surveys the icy waters ahead. A crew member approaches. “Captain, sir, we’ve just received an urgent radio message. Satellite photos show us bearing down on a large iceberg, and nearby ships respectfully asking us if we are monitoring this?” Captain growls, “Well, what do the instruments show?” “Nothing, sir.” Captain, glaring, “Well, what are you standing there for? Back to your post.” “But sir, what shall I tell the other ships?” “Tell??? Tell them NOTHING,” roars the captain. Some moments later, a loud cry is heard. “Ahoy! Iceberg spotted ahead.” Soon the deck is filled with sailors scanning the foggy seas ahead. The Captain impassively stands at the helm, maintaining his course. “Captain, what shall we do? Why don’t you turn the ship, call for help?” cries one sailor, despairing at the Captain’s apparent lack of reaction to the impending disaster. Montgomery County public schools this year passed a milestone in college preparation: Half of the 9,737 black high school students are enrolled in honors or Advanced Placement courses. Five years ago, barely one-third of African Americans participated in such classes, despite the county’s reputation as a national leader in college prep. Now, a black student in Montgomery is more likely to take an AP test than a white student elsewhere in the nation. Kalema took all the honors courses available to her in the ninth grade, then progressed into AP. As a senior, she is taking AP geography, calculus and English literature. She partly credits her counselor, Scott Woo, with her advancement. “It’s always been Mr. Woo saying, ‘I think you can take this class,’ ” she said. The county’s achievement is striking because the national surge in Advanced Placement testing has largely left black students behind. The success of urban schoolteacher Jaime Escalante with a group of minority AP students in East Los Angeles in the 1980s convinced public educators that motivation and hard work might be just as important as standardized test scores in predicting AP success. Over the past few years, that philosophy has become pervasive in the Washington region. Principals and teachers in Montgomery high schools began looking for reasons to include students in AP courses, rather than reasons to keep them out. The process evolved into a science: All students now take the PSAT, or Preliminary SAT, a strong predictor of AP potential, in the ninth grade. Principals get spreadsheets that allow them to sort students by PSAT score and grade-point average to identify those capable of AP study not enrolled in an AP course. Kalema was being groomed for AP while still in middle school. She took Algebra I, a high school course, in the eighth grade; the school system has dramatically expanded advanced math study in elementary and middle schools as a pipeline to future AP and IB study. The Wisconsin Charter Schools Association, headquartered in Madison, is seeking an Executive Director to assume the leadership role with the statewide organization. Despite growing alarm about childhood obesity and stepped-up efforts to get California’s 6.3 million public school children exercising and eating well, only one in four could stretch, lift, curl and run enough to pass the state’s annual physical fitness test. Every spring, fifth-, seventh-, and ninth-graders take the test, which includes a mile-long run and push-ups. Results from the spring 2006 tests, made public Friday, highlight a troubling trend. Today’s children are much like the nation’s adults: increasingly inactive and sedentary. The 2006 test scores show a slight gain — 1 percent — in overall performance compared to last year’s results. The reports and their authors, in interviews, portrayed an educational landscape in which test-score gaps between black or Hispanic students and whites appear in kindergarten and worsen through 12 years of public education. Some researchers based their conclusions on federal test results, while others have cited state exams, the SATs and other widely administered standardized assessments. Still, the studies have all concurred: The achievement gaps remain, perplexing and persistent. s a middle school tutor, I’m always amazed at the pride many schools feel because their middle school curriculum includes topics in pre-algebra/algebra. This sounds like good news until it becomes clear that it’s not pre-algebra that students find problematic: it’s basic arithmetic. Enabling students to have rote facts at their fingertips endows them with great self-confidence and permits them to take risks with subsequent higher-thinking math skills. This self-confidence eliminates that “fear” of math that prevails in our culture. When I was an elementary school student in the 1950s, what was drilled daily in the classroom was reinforced nightly with numerous homework problems. This is a technique that not only allows students to master the math basics, it also instills a sense of self-esteem gained through accuracy, precision and academic discipline. I was an educator in New York City for 31 years, and in my educational lifetime as dean of a Manhattan high school, a teacher in several junior and senior high schools and in summer and afternoon school tutorial programs, and a night adult-school teacher, I was involved in many new teaching programs. Education is not an activity to promote politically correct reforms. Education is a process by which students are taught fundamentals in a structured environment with the least amount of distractions and political or doctorate-minded invasions. The outrageous proposals to substitute the basics will always be with us, and the smart thing to do is not to waste the good taxpayer’s patience or money. Did the tide turn last week? A week ago, I said people who want change in the MMSD are a bunch of damn fools. We keep raising issues and making suggestions, but nothing changes. The champions of management without input must laugh themselves to sleep every night, I thought. The board proposed an independent review of the MMSD math curriculum when the superintendent defended it as good as any other math curriculum available and proposed adding math coaches. The expenditure of $1.34 million for a Madison Virtual Campus came to light and may be an item for discussion on a future board agenda. Could it be true? Could the board, parents, and citizens be taking control of the Madison schools away from the administration? Well, I teach high school kids, and I’ve sat through about five hundred IEP meetings. I have sat through meetings for kids in middle school and then meetings for the same kids in high school. And there’s one thing I can tell you. In five years, their goals had not changed one bit. In middle school, they were only expected to do 70% of their homework at 70% accuracy, and in high school, they were still only expected to do 70% of their homework with 70% accuracy. And for those of you who are reaching for your calculators because of the New New Math, that means that they only had to get 49% of their math work correct. Ever. Now if one were to bring this up before an IEP meeting, one will get looked at in much the same way that people avert their eyes at the sight of road kill. This does not equate to proficiency in a one-size-fits-all world. Budget/Financing, Community Partners, Fund Raising, School Climate, What Can I Do? Academic Blend, a 100% Fair Trade Coffee. An insurgent fundraising idea from Thoreau Elementary School’s activist parents. 4 flavors (check out the eyes), $10/pound. Email Rosana Ellman (rellmann@charter.net) to order. Add your interesting fund raising ideas to this post via the comments. The recently revealed Madison School District’s $6M structural deficit (slightly less than 2% of its $332M budget) places a premium on creative fund raising and expense reduction. The 2007/2008 budget will feature larger than normal reductions in the District’s spending increases, due to the structural deficit. But in the increasingly frenzied world of college admissions, even Zalasky is nervous about his prospects. He doubts he’ll get in to the University of Wisconsin, a top choice. The reason: his grades. It’s not that they’re bad. It’s that so many of his classmates’ are so good. Zalasky’s GPA is nearly an A minus, and yet he ranks only about in the middle of his senior class of 543 at Edina High School outside Minneapolis. That means he will have to find other ways to stand out.
. . . The average high school GPA increased from 2.68 to 2.94 between 1990 and 2000, according to a federal study. Almost 23 percent of college freshmen in 2005 reported their average grade in high school was an A or better, according to a national survey by UCLA’s Higher Education Research Institute. In 1975, the percentage was about half that. GPAs reported by students on surveys when they take the SAT and ACT exams have also risen — and faster than their scores on those tests. That suggests their classroom grades aren’t rising just because students are getting smarter. Not surprisingly, the test-owners say grade inflation shows why testing should be kept: It gives all students an equal chance to shine. More than 70 percent of schools and districts analyzed by an education audit company called SchoolMatch had average GPAs significantly higher than they should have been based on their standardized test scores — including the school systems in Chicago, Pittsburgh, Denver, San Bernardino, Calif., and Columbus, Ohio. The program is as much a social experiment aimed at leveling the playing field of access to higher learning as it is an economic development initiative meant to generate school revenue, boost the economy and reverse the effects of a middle-class flight – some say “white flight” – that began in the 1960s and continued after the 1973 court-ordered desegregation of the city’s public schools. Students and parents in Kalamazoo believe the program has made children’s educational futures so secure that some have scrapped their college-savings plans to buy household items, such as TVs. Teachers say students and parents are showing more concern about their children’s performance in school. Home sales are up, and enrollment in the public school system – roughly 11,000, down 40% from four decades ago – is on the upswing. The 985 new students this school year brought an additional $7.5 million in state aid, and the district hired 50 new teachers. No new taxes were levied because of the promise. Fifteen school districts around Wisconsin won building project referendums worth $290 million on Nov. 7, and voters in several districts also voted to raise their tax levies a collective $51 million beyond the state spending caps. Those results pleased a top state school board official, but he said it only shows how desperate times have become for many local districts, and that school advocates will be urging a re-examination of Wisconsin’s school funding formula. John Ashley, executive director of the Wisconsin Association of School Boards, said the number of districts that succeeded in getting approval of referendums showed voters value education and are willing to invest in future generations. State gifted education advocate and Madison attorney Todd Palmer recently filed a request for a judicial “summary judgement” in the matter of “Todd Palmer v. The State of Wisconsin Department of Public Instruction and Elizabeth Burmaster.” As he explained it to me in layperson’s terms, a summary judgment “is a procedure wherein a party (me) asks the judge to render a decision based on the record. I am essentially arguing that the factual issues here are undisputed, therefore the judge can render a decision without a trial. I have every expectation that this motion will decide all relevant issues (one way or the other) and therefore we will avoid a trial. The state (DPI) must respond to my motion on or before 12/1/06.” Todd expects a decision from Judge Nowakowski sometime in January, 2007. At their core, the issues before this Court are straightforward: Can a state agency ignore a legislative directive to promulgate rules governing this underserved class of children? Alternatively, can a state agency unilaterally transfer this rulemaking responsibility to local units of government in contradiction of a clear legislative directive? The clear answer to both issues is no. Two Madison West High School students have been suspended and are facing criminal charges after allegedly creating a bomb scare twice — once on Monday and on Halloween. A 17-year-old boy and a 16-year-old girl allegedly just wanted to play a practical joke, but the school’s officials said they don’t think it’s a laughing matter and are sending a strong message. Board Meeting Archives, Budget/Financing, Elections, Governance/Board Decision Making, History - Madison Schools, School Climate, What Can I Do? video here There’s been a fascinating school board discussion over the past few weeks as the 2006/2007 $332M+ Madison schools budget is finalized. “Why did our equity go down this past year since we, the board, passed a balanced budget in 2005/2006? Why did it go down by $2.8M (about a 1% variance in last year’s $319M+ budget)? “The way we have attempted to deal with maintaining the quality of education as long as we could was to budget very, very aggressively, realizing that we had an out of fund balance ($5.9M in 2006/2007). We made the decision 7 years ago or so to budget aggressively and try to manage to that budget believing that we would use less fund equity over time than if we set aside a set amount. So that’s been our approach. That fund equity has now come down to the point that we believe we can’t do that any more and we will not bring you a balanced budget that is aggressive particularly where it gets into aggressive on the revenue side in how much efficiency we believe we can budget. So, what the effect of that is to increase the amount you have to pay. We budgeted under this CFO/COO account, we budgeted that we were going to find $6.1M somewhere without saying where, and we didn’t. We found all but 2.7M of that. In this year’s budget, we have the same type of thing. We have budgeted that we’re going to find $5.9M somewhere. So, while we can look at all of our budget items, oh, we’re doing great we’re right on budget for salaries, transportation, for whatever. We can’t just meet our budget, we have to do $5.9M better than our budget. We’re going to take this up in the Finance committee to see if there is a different way we can present some of this, to be able to track it. Roger Price mentioned that this was not a new item, but was in place when he arrived in the mid 1990’s. Ruth Robarts asked about a February 2006 consultant’s forecast of the District’s equity versus Roger Price’s Numbers (52 minutes). Ruth also asked about the financial implications of the District’s retirement buyout commitments through 2009. “I’ve been on the Board a long time and did not see in the documents I’ve seen that kind of structural deficit”. Watch the video here or listen to the mp3 audio. Bottom Line: Thanks to Lawrie Kobza’s digging, the public knows about the Madison School District’s $6M “structural deficit”. This also means that next year’s balanced budget will require significantly greater reductions in spending increases, or “cost to continue approach” than we’ve seen in the past. It would also be interesting to see how our District’s “equity” or cash reserves have declined over the years. The good news regarding the budget’s “Fuzzy Math, or the balanced budget that isn’t” (there must be some)? The discussion happened publicly, on MMSDTV, and the community is now aware of looming larger budget changes than we’ve seen in the past. Unfortunately, I’ve seen no mention of this in the traditional media. Last year, amid the uproar that followed West High School’s replacement of more than a dozen elective offerings with a core curriculum for 10th-grade English, Madison Superintendent Art Rainwater told the school board that such changes would be a “major direction” in the district’s future. Some people see signs that this shift is now occurring. Concerns about eliminating course offerings are being aired at East High School, which has traditionally offered an array of elective courses in core subject areas. Principal Alan Harris is expected to unveil the plan at a parent meeting on Thursday; officials declined to release details before then. “There are a lot of reasons to be concerned,” says Lucy Mathiak, a school board member whose son attends East. “It does sound a lot like the West model, and that’s not what East parents asked for,” especially those who participated in this spring’s planning group called East 2012. But they strongly believe that their math textbooks should include actual math. Donald’s “Connected Mathematics” book at Harbour Pointe Middle School in Mukilteo asks him to arrange a list of 20 cities in order of their populations, all in the tens of millions. Yes, he concedes, he must recognize differences among numbers, but it’s a pretty low-level task for a bright sixth-grader, about as challenging as alphabetizing words. But check out the next activity: Locate the cities on a map. The Chacon-Taylor children and their parents, Hugh Taylor and Monique Chacon-Taylor, are among Snohomish County families raising questions about the effectiveness of widely used math textbooks that encourage discovery and writing about math, but de-emphasize basics such as multiplication and long division. The calls for rethinking the state’s math education come amid signs that the present system is failing large numbers of students. Just 51 percent of 10th-graders and 59 percent of fourth-graders passed the math section of the WASL in the spring. About 29,000 juniors haven’t passed the WASL math test, which they must do to graduate in spring 2008.. The Madison School District uses Connected Math in middle school. Many links and notes on math, including the recent Math Forum audio/video. a. Initiate and complete a comprehensive, independent and neutral review and assessment of the District’s K-12 math curriculum. The review and assessment shall be undertaken by a task force whose members are appointed by the Superintendent and approved by the BOE. Members of the task force shall have math and math education expertise and represent a variety of perspectives regarding math education. recommendations on measures to evaluate the effectiveness of MMSD’s math curriculum. The task force is to present the preliminary outline and a timeline to the BOE for comment and approval. assessment, consistent with the approved preliminary outline. The draft is to be presented to the BOE for review and comment. The task force is to prepare the final report on the review and assessment. MP3 Audio | Video Monday (11/13/2006) Madison School Board Performance and Achievement Committee meeting agenda originally included a discussion of the Administration’s recent quiet policy change regarding students receiving credit (paid for by parents or the District) for non-MMSD courses. The agenda item mysteriously disappeared, but several parents, including Board Member Lucy Mathiak spoke. The discussion is now scheduled for the 12/11/2006 Performance & Achievement Committee meeting. 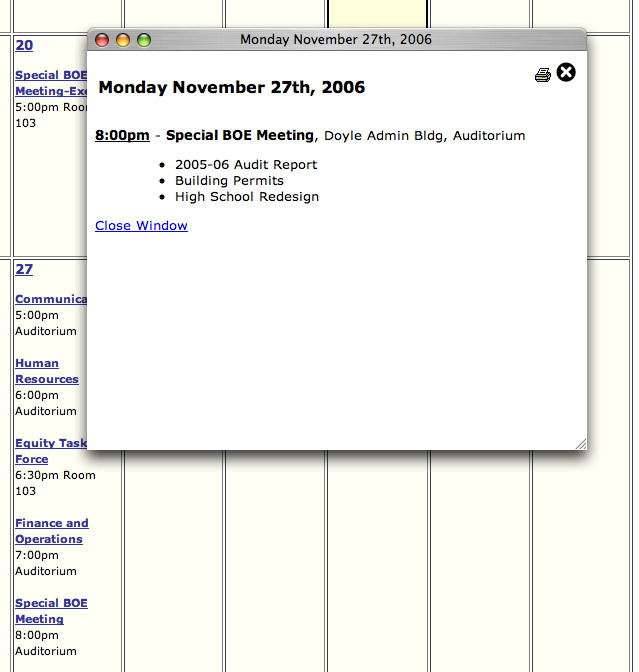 The Madison School Board will discuss the Administration’s High School Redesign plans on Monday evening, November 27, 2006, according to their calendar [screenshot]. East High School is holding a meeting this evening on their curriculum changes. Tim Schell marvels at the difficulty of serving on a local school board, and I certainly share his amazement at the volume of information presented to board members. With all of that information and time necessary to understand it, how can board effectively oversee the management of a school district? To me, effective means being certain the boards decision’s and the actions of the administration reflect the educational goals and values of a community. I’d think that a board could function most effectively if a district had a clear plan for its future — clear enough that the community can understand and support it; clear enough that the volumes of information can be understood in the context of the plan; clear enough that a board can keep the administration and itself focused on the plan; clear enough that new programs, new laws, new grants can be assessed against the plan. Little of the above seems to apply to the MMSD, so the board’s oversight of the administration happens piecemeal, largely in response to community screams about changes made unilaterally by the administration. The disussion of the Madison Virtual Campus stands as an illustration of my point; the board and the community seem to know little about it; no one seems to have discussed whether the Madison Virtual Campus might fit into a grand plan or impact other activities of the district. Just to list a few questions, could the virtual campus satisfy the requests for AP and other advanced classes? Could it reduce the need for more classrooms on the edges of the community? Could it actually reduce MMSD expenditures? Could it be used to raise academic achievement for students who are not up to grade level standards? And the big question, what’s the goal or goals of the Madison Virtual Campus? Back to my original point, the MMSD board could more effectively oversee the Madison Virtual Campus if the MMSD had a clear plan and a clear statement of how the Madison Virtual Campus fits into that plan. Budget/Financing, Governance/Board Decision Making, School Climate, What Can I Do? Department of Public Instruction (DPI). General school aids include equalization, integration (Chapter 220), and special adjustment aids. In 2006-07, $4,722.7 million from the general fund is appropriated for general school aids. Of the total amount of funding provided, including adjustments, 414 school districts are eligible for $4,620.4 million in equalization aid, 28 districts are eligible for $89.0 million in integration aid and 50 districts are eligible for $13.3 million in special adjustment aid. expenditures, regardless of property tax wealth. There is an inverse relationship between equalization aid and property valuations. Districts with low per pupil property valuations receive a larger share of their costs through the formula than districts with high per pupil property valuations. Madison, with 24,792 students will receive $56,984,764 (17.16% of the $332M+ budget) from the State (via income, sales taxes and fees). But that’s no excuse for sticking it to the little guy who already pays one of the highest gas taxes in the nation. The DOT is proposing a 45-percent increase, from $55 to $80, in the annual registration fee for cars. The governor and Legislature should quickly reject the proposed $25 hike. They also should be wary of even bigger increases proposed for registration fees on light trucks. The higher vehicle registration fees would bring in an additional $208 million to state coffers over the next two budget years. The DOT says the money is needed to fix roads and to rebuild Interstate 94 south of Milwaukee. The road work may be justified. But motorists shouldn’t get soaked just because state leaders are mismanaging the state’s money. State leaders — the governor and the Legislature — have diverted hundreds of millions of dollars from the transportation fund in recent years and spent it on other things such as public schools. To avoid road construction delays, our state leaders then borrowed money to make up the difference. The car registration fee would rise 46%, from $55 to $80. The department also wants to raise the registration fee for light trucks to $80 to $112, depending on their weight. The changes would raise the cost of a license from $24 to $34 to cover the cost of new federal requirements to make identification cards more secure. Licenses are good for eight years. The recommendations were due two months ago as part of the agency’s budget request, but the department didn’t submit them until Friday – three days after Democratic Gov. Jim Doyle was re-elected. The department noted that for years it had filed its requests about two months later than other agencies. At the same time, the governor and the Legislature can help future DOT budgets by not raiding the transportation fund to fill holes elsewhere in the state budget, something that has occurred too often in recent years and is one of the reasons for the transportation department’s structural deficit. Drivers should not be taxed by the state twice, once on income and once in fees, to meet the education budget, for example. The fees and the gasoline tax should be reserved for transportation. A useful reminder that increased local (property taxes), state (income, sales taxes and fees) or federal (income, fees) spending on education ends up coming from the same sources. A least half of eighth graders tested in science failed to demonstrate even a basic understanding of it in 9 of 10 major cities, and fourth graders, the only other group tested, fared little better, according to results released here Wednesday. The outcome of those tests, part of the National Assessment of Educational Progress, often called the nation’s report card, showed that student performance in urban public schools was not only poor but also far short of science scores in the nation as a whole. Half or a little more of the eighth-grade students in Charlotte, San Diego and Boston lacked a basic grasp of science. In six of the other cities — New York, Houston, Chicago, Cleveland, Los Angeles and Atlanta — the share of eighth graders without that knowledge was even higher, ranging from about three-fifths in New York to about four-fifths in Atlanta. Only in Austin, Tex., did a majority of eighth graders — and only barely there — have a basic understanding. By comparison, the number of eighth graders who lacked a basic grasp in the nation as a whole was 43 percent. Insubordination, bullying and fighting top the list of problems Madison schools deal with regularly. Madison police and district officials answered questions and discussed the safety challenges of local schools. Police handed out an incident report for Memorial High School. According to the report, there were 32 calls to police for fighting since last January. There were 9 calls for possible sexual assaults and one weapons violation. Police say they’re seeing more calls for weapons violations. They did not give out reports for the other high schools. Madison compares favorably to the rest of the nation on the issue of school violence. A study released in 2005 by the U.S. departments of Justice and Education indicated that nationally there was an average of 24 violent crimes for every 1,000 students on all grade levels. For Madison’s high schools last year, WISC-TV’s findings revealed 4.4 violent crimes per 1,000 students. And while that’s below the national average, district officials said they know that area parents judge things by a different standard. “It’s never willing to simply sit back and say we’re good enough, always trying to improve, always looking forward,” Yudice said. “You have to continually examine what you’re doing. You can’t ever say, ‘Boy we’ve got the answer.’ Because the one thing I promise you is, we don’t,” said Art Rainwater, Madison Metropolitan School District superintendent. For the entire 2005-2006 school year, Madison Memorial topped the list with 286 calls to police. Lafollette had 276 calls; East had 238 and West had 222. The four-year trend showed a general decline in police calls to the same schools. Of the four, only Madison Memorial has seen a slight increase — 26 percent since 2002. I asked Roger Price to point out where I could find spending for the Virtual Campus in the MMSD budget documents. “No district operating budget has been used to build the Virtual Campus,” according to the memo (original emphasis). Based on Johnny Winston’s comment, “Why don’t people know about this,” I can only assume that the administration spent $1.34 million without ever informing the Board of Education. That’s just plain wrong (my emphasis). Two new studies shed light on how the achievement gaps between groups of students grow as they move from elementary to middle school. The studies—one by researchers Eric A. Hanushek and Steven G. Rivkin and the other by the Northwest Evaluation Association—both found that black students start out school trailing behind their white counterparts, learn less over the course of the school year, and fall further behind as they progress through school. But the studies diverge as they try to pinpoint potential causes for those learning gaps. Mr. Hanushek and Mr. Rivkin, both university-based economists, suggest that the growth in the size of the learning gaps that occur as children move from kindergarten through 8th grade can be explained by certain differences in the schools that black and white children attend. “School Quality and the Black-White Achievement Gap” is posted by the National Bureau of Economic Research. “Achievement Gaps: An Examination of Differences in Student Achievement and Growth,” is available from the Northwest Evaluation Association. Gates said the experience of being a parent of three kids – ages 10, 7 and 4 – has led him to spend more time thinking about schools. Specifically, he said the U.S. education system needs higher standards, clear accountability, flexible personnel practices and innovation. Gates, whose children are in private schools, said every state should require students to take three or four years of math and science to graduate from high school – 25 states currently have such requirements. He wants states to have the power to intervene at low-performing schools. “Real accountability means more than having goals; it also means having clear consequences for not meeting the goals,” he said in a speech earlier Monday to Washington state educators who came to hear the results of an education task force. Gates said schools should also be able to pay the best teachers better and offer incentives to attract people with rare abilities. The proposed tax rate, however, is $1.83 per $1,000 of equalized value, down from $1.97 this year. That means the owner of a $250,000 house would save about $35 on the tax bill from the previous year. “(Vrakas) is calling it a tax decrease because the impact on some homeowners is that their tax bill may go down a couple bucks,” said Christine Lufter, president of the Waukesha Taxpayers League. Focusing on tax rates is “the most deceptive way of selling a budget. It’s not an indicator of government efficiency,” she said. Instead, she and Todd Berry, president of the Wisconsin Taxpayers Association, say taxpayers should focus on the entire budget picture. Meet the fourth R: reading, ‘riting, ‘rithmetic—and a reward. The Department of Education just launched the first federal program that uses bonuses to motivate teachers who raise test scores in at-risk communities, awarding $42 million this month to 16 school systems in places like Chicago, Dallas and South Carolina. Joanne has more on teacher incentives as does Mike Antonucci. Boundary changes for Lake View & Chavez? Two elementary schools at opposite ends of the Madison Metropolitan School District are bursting at the seams and may face boundary changes next year to deal with crowding. Lake View Elementary on the northeast side of the city and Chavez Elementary on the southwest side are both well over their intended capacities, with Lake View at 116 percent and Chavez at 108 percent. Lake View has an enrollment of 309 students, but is designed for 266. Chavez, with an intended capacity of 602 students, has an enrollment this year of 652 students. Today, the Faculty will begin to take on the central and difficult question of what students should know to graduate from Harvard. The Task Force on General Education has produced a serious and thoughtful answer to this question. It has proposed that the College train students for citizenship in a global society and, to that end, require students to take courses in ten diverse areas from reason and faith to analytical reasoning. I fear, however, that the proposal goes too far in rejecting the Core Curriculum’s “approaches to knowledge” in favor of teaching knowledge itself. Methodology, particularly the scientific approach to human society, should play a prominent role in general education. Like any self-involved faculty member, I could argue that the proposed program gives too little attention to my own field of economics while spending too much time on other less important disciplines. In extreme fits of economo-centrism, I can certainly convince myself that reading, writing, and breathing are pretty irrelevant relative to understanding the laws of supply and demand. I am not, however, writing this column to argue that my discipline deserves more recognition in general education. Indeed, I do not profess to know how much space in the general education curriculum should be allocated to any field, and I do not know what subjects should be focused on in other fields. I do, however, know that with regards to economics, the report focuses too much on social science topics but too little on social science methodology. More than 200 million children in China are studying English, a compulsory subject for all Chinese primary school students. By comparison, only about 24,000 of approximately 54 million elementary and secondary school children in the United States are studying Chinese. Less than 8% of United States undergraduates take foreign language courses, and less than 2% study abroad in any given year. Foreign language degrees account for only about 1% of undergraduate degrees conferred in the United States. Although there is no existing report on Chinese language courses in Oregon, some Oregon schools are independently developing their own programs for their students to learn the Chinese language. Portland Public Schools has a Chinese immersion (half day Chinese, half day English) program at Woodstock elementary that started in 1997. In the Fall 2006 semester it doubled in size from one class per grade (25-30 students) to two classes (50-60 students). So far the double class is only kindergarten. One grade will be added each year as the students get older. Some of the students are now in middle school at Hosford Middle School. A high school component will be added at either Cleveland or Franklin High School. The Portland Public Schools may start another Chinese immersion program at another elementary school in the future. Mandarin is offered at one Madison High School: Memorial. Oregon Business Plan. SEATTLE — For the second time in a generation, education officials are rethinking the teaching of math in American schools. At the same time, parental unease has prompted ever more families to pay for tutoring, even for young children. Shalimar Backman, who put pressure on officials here by starting a parents group called Where’s the Math?, remembers the moment she became concerned. Curriculum - Math, Governance/Board Decision Making, School Climate, Student Support, What Can I Do? And parents shouldn’t only be concerned about math instruction. They should be looking hard at the reading and writing parts of their kids’ educations, too. Are they learning grammar? Can they spell? Punctuate? Understand what they are reading? Most of the Ivy League English majors whose writing I grade have trouble in these areas, which suggests to me that most everyone their age does. I tend to assume that the students I see are among the most linguistically competent students of their generation–but there are still a lot of issues with things such as run-on sentences, comma splices, murky phrasing, limited vocabulary, dangling modifiers, spelling, and so on. That’s the legacy of a pedagogical attitude toward literacy that mirrors the one the mother above encountered when she inquired why her son wasn’t being taught basic math skills. When I taught high school English in a boarding school a couple of years ago, I found that a great many students there had abysmal language skills. Some bordered on functional illiteracy. When I asked whether the school taught grammar at any point, the head of school told me that teaching grammar thwarted students’ creativity and stifled their interest in reading. The utter inadequacy of that outlook really hits home when you realize that it amounts to lying to parents and kids about their kids’ abilities, and that it involves sending kids off to college without the skills they will need to succeed there. For the second time in a generation, education officials are rethinking the teaching of math in American schools. “When my oldest child, an A-plus stellar student, was in sixth grade, I realized he had no idea, no idea at all, how to do long division,” Ms. Backman said, “so I went to school and talked to the teacher, who said, ‘We don’t teach long division; it stifles their creativity. Grass-roots groups in many cities are agitating for a return to basics. Many point to California’s standards as a good model: the state adopted reform math in the early 1990s but largely rejected it near the end of the decade, a turnaround that led to rising math achievement. Notes and links here. More comments. Joanne has more on “word problems“. Just Whose Idea Was All This Testing? Critics say standardized testing has robbed schools of the creative clash of intellects that make Plato’s dialogues still absorbing. “There is a growing technology of testing that permits us now to do in nanoseconds things that we shouldn’t be doing at all,” said educational psychologist Gerald W. Bracey, research columnist for the Phi Delta Kappan education journal. Only the suburban bargain the Ophirs thought they were getting turned out to be no bargain at all. They chose the Yorktown school system, a relatively well-off district whose students consistently outscore their peers on state tests. But the Ophirs came to view the schools as uninspiring and unresponsive, and now they pay $51,000 a year for their children, 11-year-old Dylan and 9-year-old Sabrina, to attend the private Hackley School here — on top of $23,000 annually in property taxes. The Equity Task Force will be holding two public sessions this week and is continuing to collect feedback via the web. The first session will be hosted by the Falk PTO as part of their regular meeting, between 6:30 and 8:00 pm on Tuesday November 14th in the LMC. The second will be Wednesday November 15 at 11:30 am at Centro Hispano, 810 W. Badger Rd. That’s the official information. Unofficially (as a Task Force member, but not speaking for the Task Force), I’d like to explain a little about this phase of our work. What we are seeking is kind of a reality check, a general sense of what others think about equity, what is important to them and what they would like an equity policy to do. We want to consider this information as we prepare our report to the Board of Education. When we finish with our recommendations and present them to the Board of Education there will be plenty of opportunities to weigh in on the specifics. The key players involved – a group that you would not have found at the same table often in the past – are the GMC, which is generally composed of business and civic leaders; the Milwaukee School Board; schools Superintendent William Andrekopoulos; and the Milwaukee Teachers Education Association, the union representing more than 8,000 MPS employees. Sister Joel Read, the retired president of Alverno College who chairs the Greater Milwaukee Committee’s education committee, said Milwaukee is a risk-averse city and change in MPS would involve risks for everyone, but she was optimistic about what will result from the effort. “I think there’s a new day here in Milwaukee,” she said. East High School to Follow West’s One Size Fit’s All 9/10 Curriculum? The plan for East HS is to have only regular classes (that is, no Advanced (formerly AcaMo) and no TAG classes) and AP classes (which, presumably, only juniors and seniors will be able to take). East currently offers 9 AP classes. This means there will be a core curriculum delivered in completely heterogeneous classes (except for the special ed and ESL classes) across the boards in 9th and 10th grades. Our source did not specify if this means the end of Paul DuVair’s renowned TAG Biology class. There also is no word on embedded honors options, like West now offers (though we have heard many reports about how profoundly uneven implementation is — aside from the fact that embedded honors options rarely give students the critical opportunity to learn together at a high level). The only exception to this plan will be math, largely because the kids enter East already ability grouped (i.e., some into Algebra, some into Geometry, etc.). I wonder how Shabazz fits into this? It seems like an outler, given the current high school curriculum direction. Is Science Education Failing Students? In many classrooms, science textbooks add to children’s misconceptions. William Beaty, an engineer who designed an electricity exhibit for the Boston Museum of Science, discovered “a morass of misconceptions, mistakes, and misinformation” in grade school science textbooks. In fact, he couldn’t find a single book that explained basic electricity correctly. North Carolina State University physics professor John Hubisz found similar problems in a two-year study of middle-school science textbooks. All told, he compiled 500 pages of errors in 12 textbooks, including mix-ups between fission and fusion, incorrect definitions of absolute zero, and a map showing the equator running through the southern states. Reporting on the ways science textbooks are developed and sold to schools, Forbes writer David McClintick says many companies “churn out rubbish” with countless errors. One widely adopted text, for instance, claims the earth rotates around the sun, when it actually revolves around the sun and rotates on its axis. The move has already divided students and educators who fear it could damage the English language. New Zealand’s Qualifications Authority said Friday that it still strongly discourages students from using anything other than full English, but that credit will be given if the answer “clearly shows the required understanding,” even if it contains text-speak. Tommy Franks issued battle orders in Iraq via Powerpoint [see also Thomas Ricks “Fiasco“]. One can imagine the techniques a future General will use…. College Preparation, Curriculum - Math, Governance/Board Decision Making, School Climate, Student Support, What Can I Do? Problem: Find the slope and y-intercept of the equation 10 = x – 2.5. Solution: The equation 10 = x – 2.5 is a specific case of the equation y = x – 2.5, which has a slope of 1 and a y-intercept of –2.5. This problem comes from a 7th grade math quiz that accompanies a widely used textbook series for grades 6 to 8 called Connected Mathematics Program or CMP. The solution appears in the CMP Teacher’s Guide and is supported by a discussion of sample student work. Richard Askey, a mathematician at the University of Wisconsin at Madison, reported, “I was told about this problem by a parent whose child took this quiz. The marking was exactly as in the text.” Students instructed and graded in this way learn incorrect mathematics, and teachers who know better may be undermined by their less informed peers, armed with the “solution.” This example is far from the only failing of CMP. Among other shortcomings, there is no instruction on division of fractions in the entire three year CMP series, and the other parts of fraction arithmetic are treated poorly. Is CMP just an anomaly? Unfortunately not. CMP is only one of more than a dozen defective K-12 math programs funded by the National Science Foundation. More specifically, the NSF programs were created and distributed through grants from the Education and Human Resources (EHR) Division within the NSF. In contrast to the NSF’s admirable and important role in supporting fundamental scientific research, the EHR has caused, and continues to cause, damage to K-12 mathematics education. Notes and links on math curriculum. Audio / Video from the recent math forum. Connected Math is widely used within the Madison School District resulting in no small amount of supplementing by teachers, students and parents. Washington, DC (November 2, 2006)-The American Association on Mental Retardation (AAMR), a 130-year old association representing developmental disability professionals worldwide, has changed its name to the American Association on Intellectual and Developmental Disabilities (AAIDD), establishing a new standard in disability terminology and making way for a more socially-acceptable way of addressing people with intellectual disabilities. The AAIDD is arguably best-known for officially defining the condition of mental retardation for the world, and its successful advocacy in abolishing the death penalty for victims with this condition in the United States. The name change will take effect January 1, 2007. “This new name is an idea whose time has come,” says Doreen Croser, Executive Director of AAIDD. “Individuals with disabilities and family members do not like the term ‘mental retardation’ and their advocacy is encouraging political and social change at national, state, and local levels. Our members demanded that we keep up with times and they voted for this name change.” AAIDD members consist of faculty members, researchers, and service professionals working with people with intellectual disabilities in settings such as group homes, institutions, schools, hospitals, private clinics, colleges, and university centers. The name of the AAIDD has been an ongoing source of contention in the disability community. While it is widely perceived that mental retardation (MR) is a condition that exists, it was also recognized that the term is prone to abuse, misinterpretation, and has devolved into an insult, especially for people with disabilities and family members. Further, the name AAMR was perceived as not in keeping with the progressive orientation of the information, products, and services offered by the Association. The applause from the community of people with disability was unanimous once the name change was announced. “In taking ‘MR’ out of your name, you’ve set a precedent for it to be taken out of the classrooms, the doctors’ offices, personal case records, and eventually out of the vocabulary of people walking down the street,” says Amy Walker of Illinois Voices, a group working on behalf of people with intellectual disabilities. Hank Bersani, current President of AAIDD explains, “Intellectual disability is a more accurate and modern term, and is also in keeping with terminology in Europe and Canada. We want to move away from any use of the word ‘retardation,’ while still allowing educators and other professionals to accurately describe the needs of the people they serve. Further, with the new name, we are reminding our members and the public that our mission has long included people with various developmental disabilities.” Most members of AAIDD work closely with people with developmental disabilities since conditions such as autism and Down syndrome often co-exist with an intellectual disability. Despite the new name, the core mission of the Association still remains the same-to promote progressive policies, sound research, effective practices, and universal rights for people with intellectual and developmental disabilities. The AAIDD has changed its name four times since its inception is 1876. The Association last changed its name in 1987 to the American Association on Mental Retardation. Apart from its definition and advocacy work, the AAIDD is well-known for its journals, the American Journal on Mental Retardation and Mental Retardation. In recent times, the Association has received critical acclaim for the Supports Intensity Scale, a planning tool that empowers people with intellectual disabilities to live a desired life by getting services based on individual needs, not deficits. Learn more about AAIDD at www.aamr.org. For the last few years, we’ve heard the mantra from many school board members and the administration – no money, no money, no money – especially for new programs. Development of the virtual classroom once again confirms the administration’s approach to managing the MMSD to minimize input from any source other than administrative staff in the Doyle Building. The administration always seems to find money for what it wants to do, such as a new classroom at Marquette, but never money for suggestions from others. Is Admissions Bar Higher for Asians at Elite Schools? Though Asian-Americans constitute only about 4.5% of the U.S. population, they typically account for anywhere from 10% to 30% of students at many of the nation’s elite colleges. Even so, based on their outstanding grades and test scores, Asian-Americans increasingly say their enrollment should be much higher — a contention backed by a growing body of evidence. Whether elite colleges give Asian-American students a fair shake is becoming a big concern in college-admissions offices. Federal civil-rights officials are investigating charges by a top Chinese-American student that he was rejected by Princeton University last spring because of his race and national origin. The Performance and Achievement Committee meeting of August 21, 2006 has been posted to the at Performance and Achievement sub-blog. The agenda of the meeting was to cover which topics would be the focus of this academic year’s meetings, and received a report on ESL from the ESL Coordinator Amy Christianson. One of the better-kept secrets in Madison is that the school district currently offers more than 100 online courses for city high school students. The program is called the Madison Virtual Campus. “It turns out Madison is a leader in this technology,” says Johnny Winston Jr., the school board president. “My first question was, ‘Why don’t people know about this?’” He thinks virtual schools could help keep students who might leave for other options. But officials have purposely kept the program under wraps as they’ve fine-tuned it. There’s no mention of the program on the district’s Web site, and most parents have never heard of it. The district has spent five years building infrastructure, training staff and convincing stakeholders of the growing demand for virtual learning. The big question is how fast the district wants its students to take advantage of the Madison Virtual Campus. Currently, only eight high school students are taking online courses for credit. Another 14 middle school students are taking an online geometry course through the Kiel school district, with a Madison teacher providing support, to meet demands by the local teachers union. The experiment — an attempt to downsize the American high school — has proven less successful than hoped. The changes were often so divisive — and the academic results so mixed — that the Gates Foundation has stopped always pushing small as a first step in improving big high schools. Instead, it’s now also working directly on instruction, giving grants to improve math and science instruction, for example. Most of the dozen-and-a-half Washington schools with so-called “conversion” grants have ended up only as hybrids — a mix of small-school elements added to big-school features. Going forward, the foundation is advocating a core curriculum that all high-school students would be expected to take, he said. And it wants to help improve math and science instruction by backing efforts to increase math requirements for high-school students, and to train more math and science teachers and pay them better. Curriculum, Governance/Board Decision Making, History - Madison Schools, School Climate, Student Support, Teacher Support, What Can I Do? Many parents are actively researching educational options for their young children. Increasingly, they are expecting more from public schools than the one-size-fits-all model schools have traditionally offered. Across the state, school districts are opening more charter schools and boosting their offerings of online and virtual classes to diversify educational approaches. Some see these alternatives as necessary for the future of public school districts — especially urban ones struggling to eliminate the racial and income achievement gaps while expanding opportunities for both struggling and high-performing students.